As Thanksgiving approaches, Hospice of Santa Barbara has much in which to be grateful. The nonprofit is especially thankful for those who participated in a recent ‘Round Up’ campaign, which raised funds for the many invaluable programs and services Hospice of Santa Barbara provides for the community. Since 1974, the Hospice of Santa Barbara has provided compassionate care and programs to those suffering from serious illness or grieving the death of a loved one. Initially, the Round up Campaign started in August. Shoppers at the Santa Barbara Home Improvement Center had the opportunity to round up their purchases to the nearest dollar amount. However, the Santa Barbara Home Improvement Center had to put the Hospice of Santa Barbara campaign on hold in order to focus on raising immediate funds for those affected by natural disasters including victims of Hurricane Harvey and California’s wildfires. Once that fundraiser came to an end, the Santa Barbara Home Improvement Center generously picked up the Round up Campaign again and raised a grand total of $10,000. 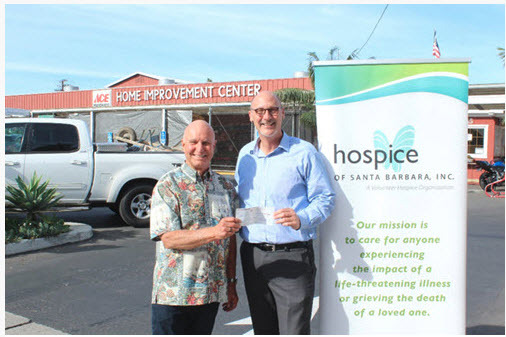 “The programs and services of Hospice of Santa Barbara are brought to our patients and clients free of charge and it is because of the generosity of organizations like Santa Barbara Home Improvement Center that this can happen,” said David Selberg, CEO of Hospice of Santa Barbara.